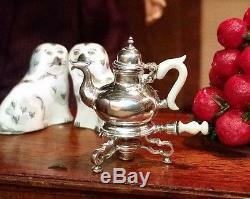 Tea/Coffe Pot by Obadiah Fisher. 1 1/16 Tall (including stand). Please notice that the hand carved handle is the harder to find white ebony instead of. The more typical black ebony usually seen on this Pot & Stand. Free S&H to the Continental US ONLY!! 1st class international, so please do not ask. 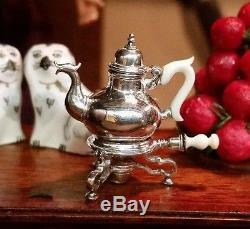 The item "Miniature Dollhouse Artisan Obadiah Fisher Sterling Silver Tea/Coffee Stand Pot" is in sale since Monday, February 15, 2016. This item is in the category "Dolls & Bears\Dollhouse Miniatures\Artist Offerings".